The North Carolina General Assembly created Cleveland County from parts of Rutherford and Lincoln counties in 1841. Before the first courthouse was built, court was held on the second floor of Williams Weather's home southwest of Shelby. 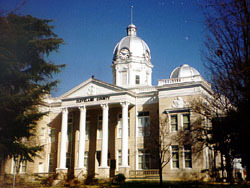 Courthouse Square became the site of the county government once the first courthouse, a log building, was erected here in 1842. Shortly thereafter, in 1844, a committee was appointed to draft plans for a formal courthouse. This committee's plans were rejected and a new committee was formed. Finally, a contract of $6,409 was awarded to George Smith, who posted a bond of $12,938 for the "faithful performance" of constructing a red brick courthouse, completed in 1874. This courthouse was then replaced by the dramatic limestone building standing on Courthouse Square today. 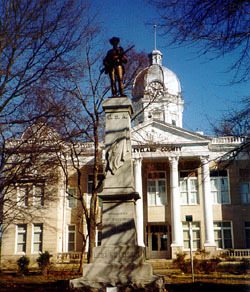 In front of the courthouse, facing Lafayette Street, is the Statue for the Confederate Heroes of Cleveland County dedicated on November 21, 1906. In 1974, the county court moved to the law enforcement center and in 1976 this building became home to the Cleveland County Historical Museum, it is currently home to the Earl Scruggs Center. The Cleveland County Courthouse is located on the square in Uptown Shelby, bounded by Lafayette, Main , Washington and Warren sts. in the Central Shelby Historic District. For more information visit the website.